As problematic as these issues can be—along with how catastrophic they can be—there are simple steps that can be taken to avoid them, ensuring you get the most out of these critical boiler parts. This can seem self explanatory, but many people often choose to buy the least expensive valves, or simply don’t know how to differentiate between a good and a bad one. In the case of the former, it cannot be overstated that purchasing a valve simply based on the lowest price can become a major problem. Boilers are a very substantial investment, and when choosing the right valves, a poor quality product can ruin an otherwise good and expensive piece of machinery. When you compare the relative cost of a high quality valve to the cost of valve and boiler failure, it’s evident that spending money on a good valve will save money in the end. Of course, there are plenty of good valves that are also cost-effective. The key is to nd a valve manufacturer or distributor with experience and knowledge. They will not only provide you with the best valves, but also with the right ones for your application. If you don’t know which valve is the best for you, a quali ed expert can guide you. Considering wear and tear are some of the leading causes of valve failure, this is what you want a quali ed individual to be looking for, and doing so regularly. First and foremost, various maintenance tasks should be performed on a monthly, semi-annual, and annual basis. Secondly, keeping a maintenance log will keep track of all ndings and ensure timely repairs, if necessary. Quali ed inspectors will check the pressure surge; when it exceeds maximum operating pressure, wear and tear will occur and over time, failure will become much more likely. They will also look for the numerous factors that contribute to the issues as previously discussed. For example, they can be sure the boiler is not running too hot, which will burn a valve. 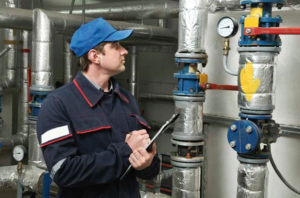 Furthermore, having a quali ed technician perform regular maintenance, one who is familiar with valve operation, design, maintenance, and repair, means they will know what to look for, no matter how small. They will also be well aware of all standards that are directly related to valve repair, as set forth by the National Board of Boiler and Pressure Vessel Inspectors. If you do not have access to a quali ed technician, contact the company from which you purchased your quality boiler valve.